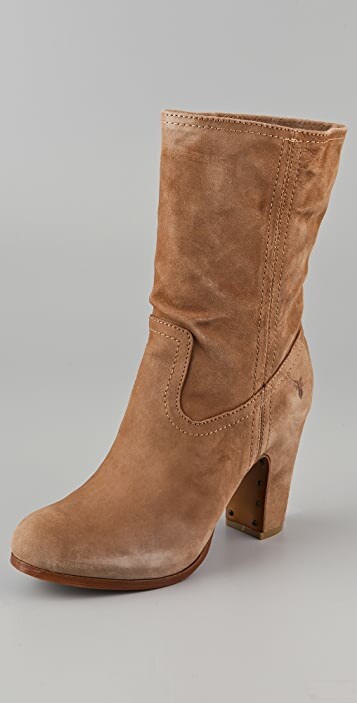 These distressed suede boots feature a rubbed toe and heel cap. Seam details at ankle and embossed logo at outer side. Hidden platform and covered heel. Non-slip rubber patch at leather sole. * Shaft: 8" (20.5 cm). These boots fit true to size and are very comfortable. Not too high and a little worn-in looking. 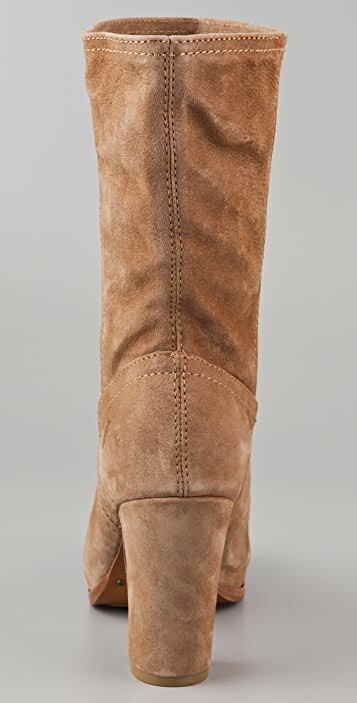 Great little casual boot. For what I paid I am very happy with my purchase. The boots are very comfortable and will work extremely well for winter. I would say that the colour is lighter than appears in the photos more like camel but that doesn't bother me. These boots were a bit larger than I expected. I thought it was a big larger than a US 8. I have another pair of frye boots, which also claimed to be a true US8, and that fit fine. I had briefly considered getting a 7.5, but I was worried that half a size smaller may mean trouble getting my foot in (no zip or lace-up). It's quite roomier at the heel area. 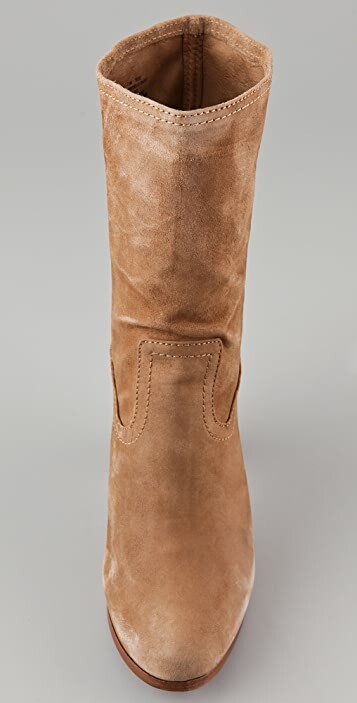 but otherwise, it's a comfortable height for a boot, which would go seamless from day-to-night. Like all of frye's boots, they are well made, however I did think there wasn't much padding in the footbed, and the boot was a little slippery. so I'd strongly suggest scratching up the soles for more grip. It also didn't impress me as other frye shoes I've had previously. They came up to to mid calf for me. and look good with blue jeans. I had originally intended them for some of my coloured denims... but they looked just a tad weird with my salmon-coloured Cheap Mondays.